Last week I was at an architectural salvage place, and someone had just dropped off a Dometic RM2310 3-way (propane, 110v, 12v) refrigerator. I plugged it into a power outlet and… it works! 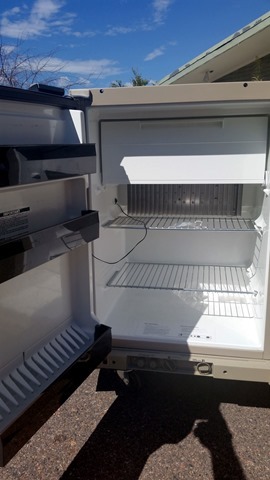 Evidently the original owner, an older guy, had actually returned the day before to bring in some additional things for the fridge that he hadn’t been able to find when he dropped it off (original receipt, schematics, operating manual, etc. ), so I’m guessing it was well taken care of. 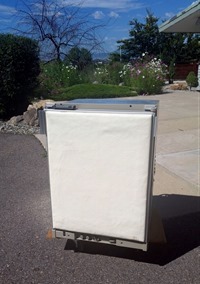 My dad just paid $1,000 for a new Dometic fridge for his camper-van, so $25 for mine seems pretty darn good! Yahoo! It even has a groovy, padded, off-white vinyl front, which I think we may keep! With my extreme love of cooking, I was originally planning for a larger fridge and will still likely end up with one in the future, but this is a great way to at least start out with a solid, propane powered RV fridge for almost no money.